The Completer Kits provide all the basic components necessary to operate the Argonite cylinders. The kits consist of hoses, connection fittings, pressure gauges, actuation devices required to operate the cylinder valve and warning signs to be displayed in the area(s)protected by an Argonite fire extinguishing system . The Control Panels vary in features and complexity but in all cases are used to monitor the detection, actuate the alarms, initiate the agent discharge and control auxiliary functions such as shut down of vital equipment and ventilation dampers. The Detection and Alarm devices provide fire detection by means of thermal or smoke detectors, audible and visual pre-alarm warnings and annunciation of the Argonite discharge. Argonite is an inert gas mixture, in equal parts, of Nitrogen and Argon. Both substances are naturally occurring and present in the atmosphere. Argonite is safe for use in occupied spaces and poses no threat to the environment. The Argonite system extinguishes fire by reducing the oxygen content. Argonite is a mixture of 50% pure Nitrogen and 50% pure Argon. Argonite contains only naturally occurring substances, and as such, has no ozone depletion potential and no direct global warming potential. Argonite extinguishes by means of reducing the oxygen content within a room to the point at which fire can no longer burn, but without compromising the safety of individuals present. There are no toxicological factors associated with the use of Argonite. Argonite will not decompose or produce any by-products when exposed to a flame from a fire condition. 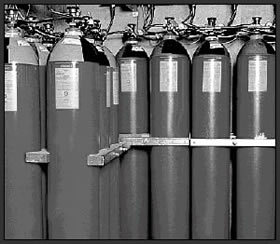 Inerting Gases (Remove Oxygen from air to support life but not fire). Argonite is a mixture of Argon and Nitrogen. IG-55 - i3 - Proinert - C60 - Ginge Kerr are all associated with Argonite.